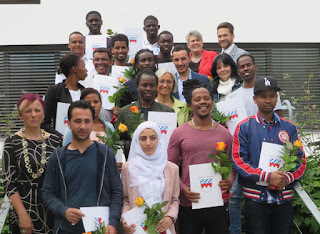 Yesterday was the last day of the school year, and the class of refugees where I have been teaching German this past year received their documentation that they completed the course. It's not really a diploma or report card, but a piece of paper that shows what they did with themselves this past year. 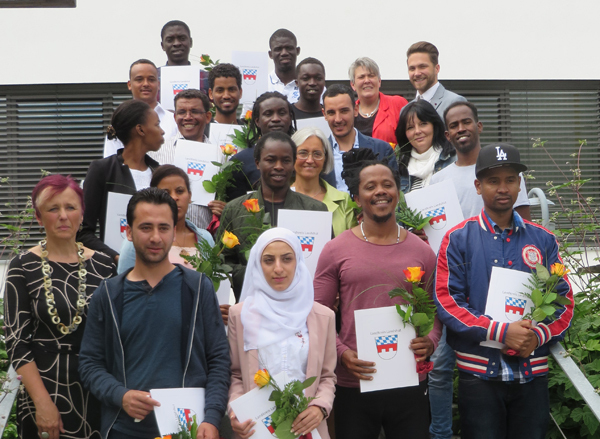 We still don't know whether the Senegalese amongst them will be allowed to start the apprenticeship/education that all of this was a preparation for, but our little celebration on Friday was nice and cheerful. Except for the moments when I started to cry during the little speech I had prepared. I had practised the paragraph which I thought would be the most likely one to make me cry several times, and I got through that one alright. But another one a bit later, which I had not read out loud so often then caught me... But I guess that's ok after all that emotional upheaval throughout the year. The good news for me was that there will be another class starting in September, so I will be teaching again. It just hasn't really hit home yet, I find it hard to rejoice on my good luck when I don't know for the students of this year. But neither of them had understood when I said I might not agree to teach again next year if they did not get their permit, they all said I should teach and not bother about them. Have a good rest! I am glad you have teaching again. The two may not get a permit, but there are plenty of others who still need your help.